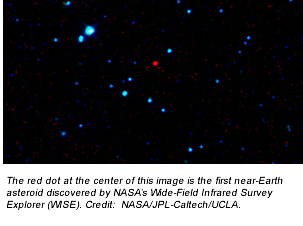 NASA’s Wide-field Infrared Survey Explorer (WISE) has spotted its first never-before-seen near-Earth asteroid, the first of hundreds it is expected to find during its mission to map the whole sky in infrared light. There is no danger of the newly discovered asteroid hitting Earth. The near-Earth object, designated 2010 AB78, was discovered by WISE on January 12. The mission’s sophisticated software picked out the moving object against a background of stationary stars. As WISE circled Earth, scanning the sky above, it observed the asteroid several times during a period of one-and-a-half days before the object moved beyond its view. Researchers then used the University of Hawaii’s 2.2-meter (88-inch) visible-light telescope near the summit of Mauna Kea to follow up and confirm the discovery. The asteroid is currently about 158 million kilometers (98 million miles) from Earth. It is estimated to be roughly 1 kilometer (0.6 miles) in diameter and circles the Sun in an elliptical orbit tilted to the plane of our solar system. The object comes as close to the Sun as Earth, but because of its tilted orbit, it will not pass very close to Earth for many centuries. This asteroid does not pose any foreseeable impact threat to Earth, but scientists will continue to monitor it. Near-Earth objects are asteroids and comets with orbits that pass relatively close to Earth’s path around the Sun. In extremely rare cases of an impact, the objects may cause damage to Earth’s surface. An asteroid about 10 kilometers (6 miles) wide is thought to have plunged into our planet 65 million years ago, triggering a global disaster and killing off the dinosaurs. Additional asteroid and comet detections will continue to come from WISE. The observations will be automatically sent to the clearinghouse for solar system bodies, the Minor Planet Center in Cambridge, Massachusetts, for comparison against the known catalog of solar system objects. A community of professional and amateur astronomers will provide follow-up observations, establishing firm orbits for the previously unseen objects. On January 14, the WISE mission began its official survey of the entire sky in infrared light, one month after it rocketed into a polar orbit around Earth from Vandenberg Air Force Base in California. By casting a wide net, the mission will catch all sorts of cosmic objects, from asteroids in our own solar system to galaxies billions of light-years away. Its data will serve as a cosmic treasure map, pointing astronomers and telescopes, such as NASA’s Spitzer Space Telescope and the upcoming James Webb Space Telescope, to the most interesting finds. WISE is expected to find about 100,000 previously unknown asteroids in our main asteroid belt, a rocky ring of debris between the orbits of Mars and Jupiter. It will also spot hundreds of previously unseen near-Earth objects. By observing infrared light, WISE will reveal the darkest members of the near-Earth object population — those that don’t reflect much visible light. The mission will contribute important information about asteroid and comet sizes. Visible-light estimates of an asteroid’s size can be deceiving, because a small, light-colored space rock can look the same as a big, dark one. In infrared, however, a big dark rock will give off more of a thermal, or infrared glow, and reveal its true size. This size information will give researchers a better estimate of how often Earth can expect potentially devastating impacts.